This neon Scania truck sign really stands out in the truck and looks the part with the griffin heads glowing brightly with there crowns, a great cab accessory to make your Scania truck really stand out from the crowd at a truck park. 24 Volt LED Light Neon Plate for Trucker Custom Neon truck signs Blue Illuminating Sign Cabin Decoration Accessories Laser Engraved 24V / 5W. 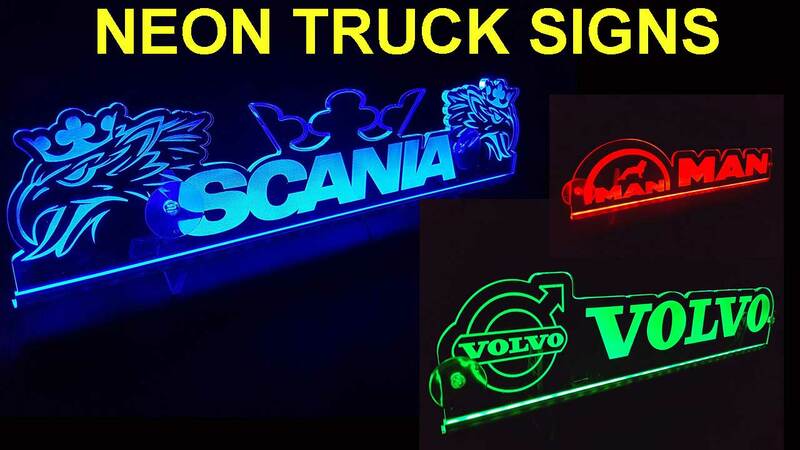 This Scania neon sign glows white and has the Scania motif badge each side a great Scania cab decoration for your truck. 24 Volt LED Light Neon Plate for SCANIA Trucker Custom Neon truck signs White Illuminating Sign Table Crown Cabin Decoration Accessories Laser Engraved 24V / 5W. The red Scania neon sign is a real stunner with the badge one side and V8 badge glowing on the other making your cab really look the part to impress your fellow colleagues when out on the road. 24 Volt LED Light Neon Plate for Trucker Custom Neon truck signs Red Illuminating Sign Table Crown Eagle Cabin Decoration Accessories Laser Engraved 24V / 5W. 12V LED Cabin Interior plate GRIFFIN for SCANIA trucks illuminating table sign (Blue), LED Cabin Interior Light for SCANIA trucks; Work on 12 Volts; Smooth blue neon-style lighting; Could be easily fitted on the front window through two suction caps (included in the set); Do not impede driving at night; To be switched on in 12V cigarette lighter terminal; Size: 250mm (10″) length, 90mm (3 3/5″) height, 6mm (1/4″) thickness; Cable length: 150cm (60″). 24 Volt LED Light Neon Plate for Trucker Custom Neon truck signs Green Illuminating Sign Table Cabin Decoration Accessories Laser Engraved 24V / 5W. 24 Volt LED Light Neon Plate for Trucker Custom Neon truck signs White Illuminating Sign Table Cabin Decoration Accessories Laser Engraved 24V / 5W. 24 Volt LED Light Neon Plate for Trucker Custom Neon truck signs Red Illuminating Sign Table Cabin Decoration Accessories Laser Engraved 24V / 5W. 3D YOUR NAME Custom Neon truck signs 12V 24V Light LED Neon Plate Trucker Truck Custom Personalized Sign ILLUMINATING ONLY FORWARD – Doesn’t Bothering You While Driving. Equipped with Two Suction Cups for Easy Fitting on the Front Window, Made in EU, Long LED Life – 20 000 h.
The MAN truck is very popular in recent years with truck drivers across the country this red glowing MAN neon truck sign looks excellent in the cab a very popular colour choice with MAN drivers. 24 Volt Custom Neon truck signs LED Light Neon Plate for Trucker Truck Red Illuminating Sign Table Cabin Decoration Accessories Laser Engraved 24V / 5W. The MAN blue neon truck sign gives a really nice glow in the cab, a great choice cab decoration for a MAN truck. 24 Volt LED Light Neon Plate for Trucker Custom Neon truck signs Blue Illuminating Sign Table Cabin Decoration Accessories Laser Engraved 24V / 5W. 24 Volt Custom Neon truck signs LED Light Neon Plate for Trucker Truck White Illuminating Sign Table Cabin Decoration Accessories Laser Engraved 24V / 5W. 24 Volt LED Light Custom Neon truck signs Neon Plate for Trucker Truck Green Illuminating Sign Table Cabin Decoration Accessories Laser Engraved 24V / 5W. 24 Volt Custom Neon truck signs LED Light Neon Plate for Trucker Truck Blue Illuminating Sign Table Cabin Decoration Accessories Laser Engraved 24V / 5W. 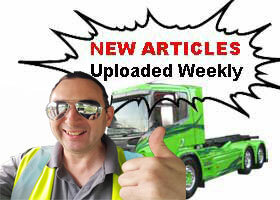 Thank you for reading this Article “Custom Neon Truck Signs UK Truckers” and also checking out some of my favorite neon signs, if you would like to leave a comment of your views please do so below.